A fun, healthy potluck dish. 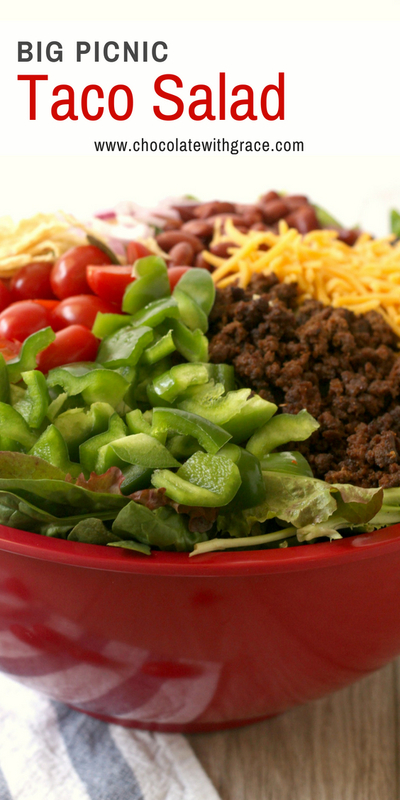 Try this Big Picnic Taco Salad. 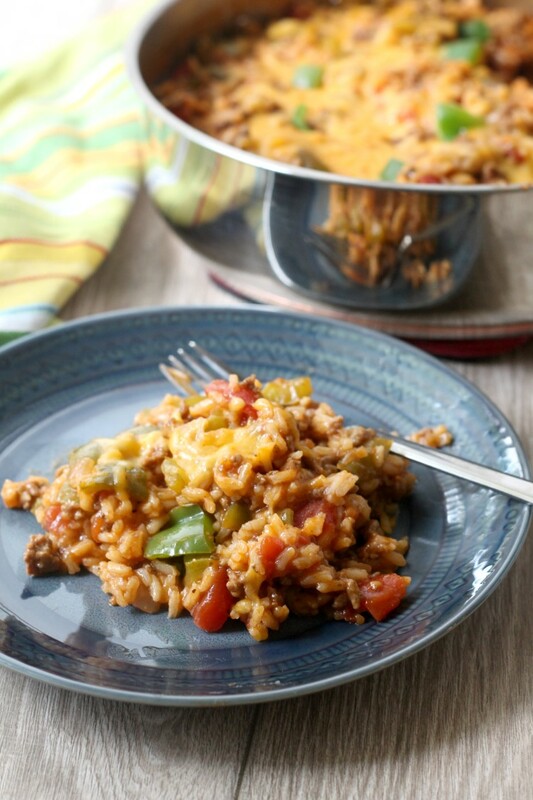 It comes together quickly, serves a crowd and is everybody’s favorite. 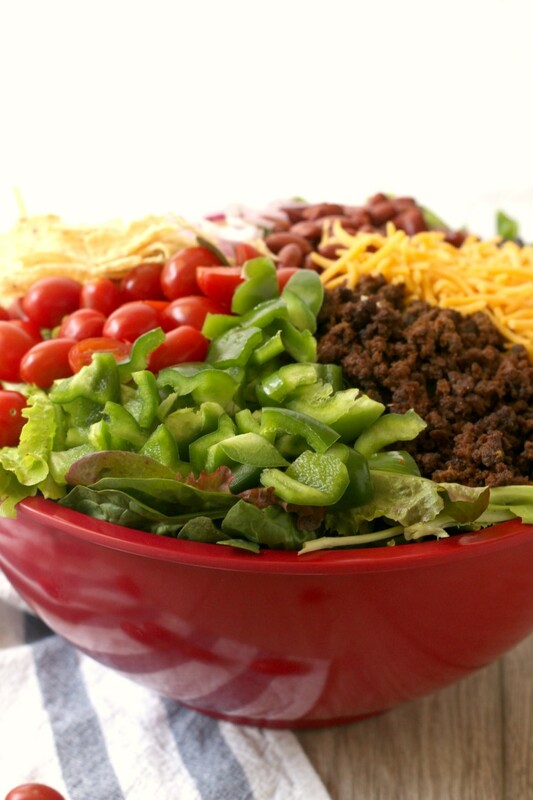 This was a favorite salad growing up. I remember my mom making it to take to the Sunday School Picnic and other potlucks. I also remember her making it for supper with fresh garden lettuce. It was a hearty salad perfect for a summer meal. Speaking of which, I used my own garden lettuce to make this salad and I ate it for lunch for several days in a row. After a rocky gardening start, it’s doing well. The cool weather has kept it from going to seed and we have gotten lots of good salads out of it. Do you ever have salad for supper. 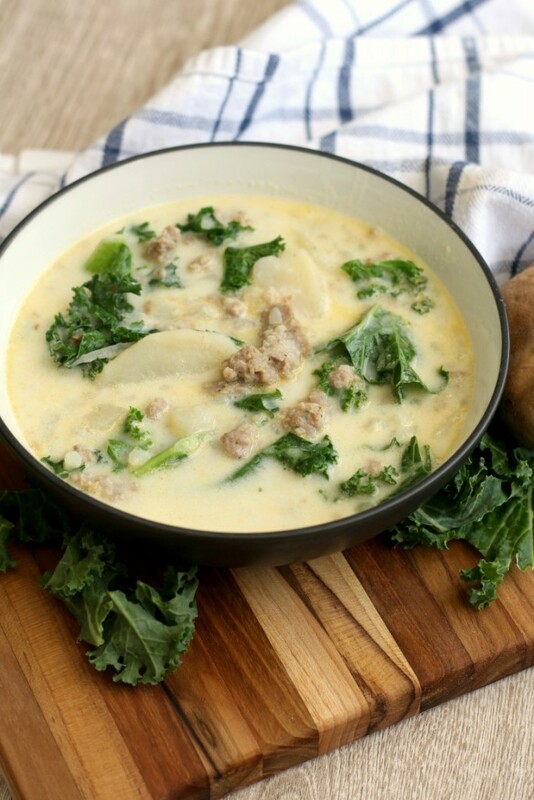 Growing up, we ate a bigger meal at noon most of the time and then our evening meal was simpler, often soup. It fit well into the farming, homeschool family I grew up in. My body loves eating like that today, except with a husband who comes up for supper and wants a hearty meal. So we’ve switched and now eat more like regular people. 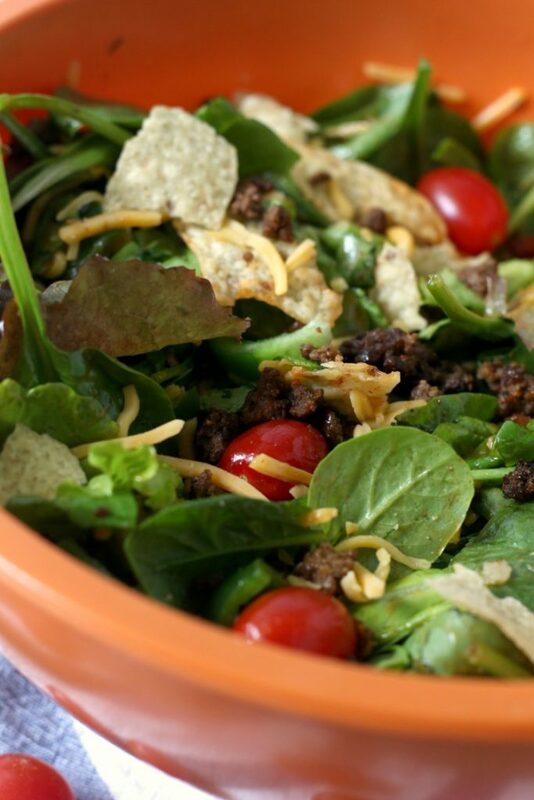 Although this salad is hearty enough that I’ve served it for supper several times with no complaints from him. 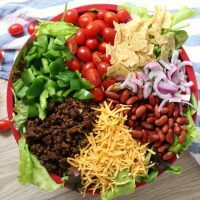 This salad uses a mixture of red French and Italian salad dressing which is what makes this salad great. And of course the dressing is going to be best if you make them both homemade. Please try it at least once. If that isn’t your thing, you can always substitute your favorite dressing. Ranch if you must or a Cilantro Dressing sounds good too. This Avocado version from Pinch of Yum is one I’d try. 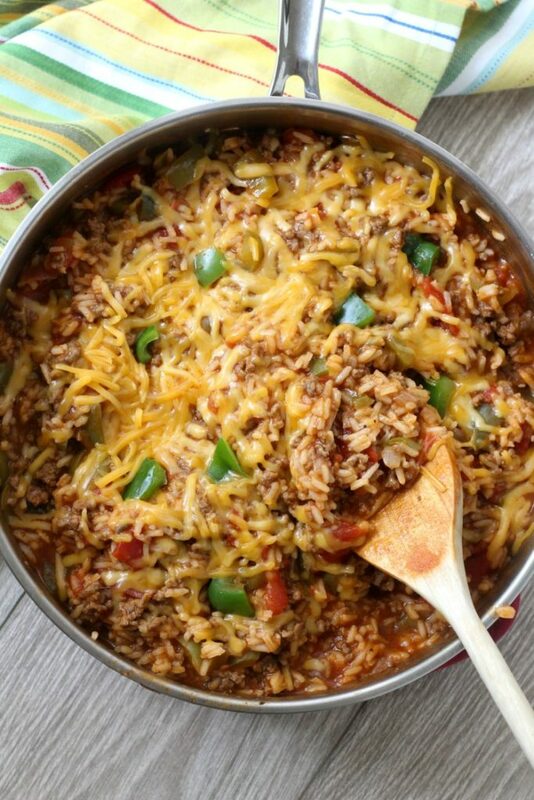 This would also be an easy make ahead Potluck dish. Just prep all the ingredients ahead of time and then toss them together right before serving. Easy Peasy. A fun, healthy potluck dish. 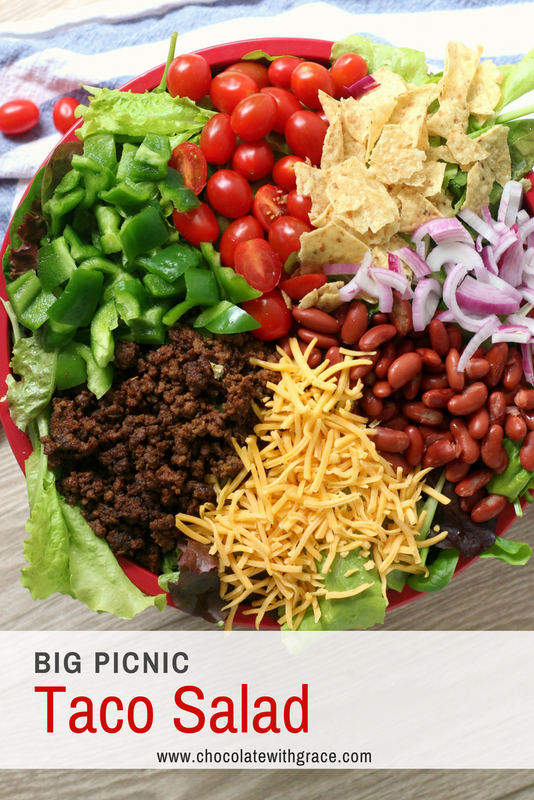 Try this Big Picnic Taco Salad. 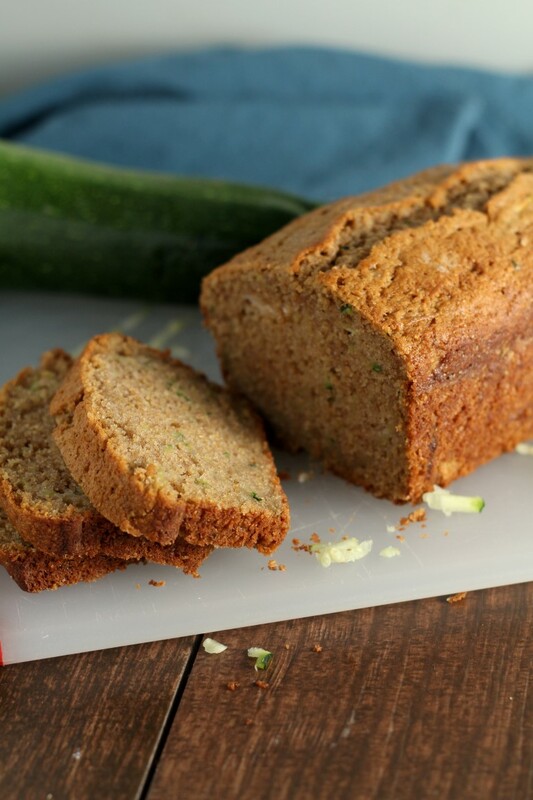 It comes together quickly, serves a crowd and is everybody's favorite. 2-3 cups slightly crushed tortilla or corn chips. 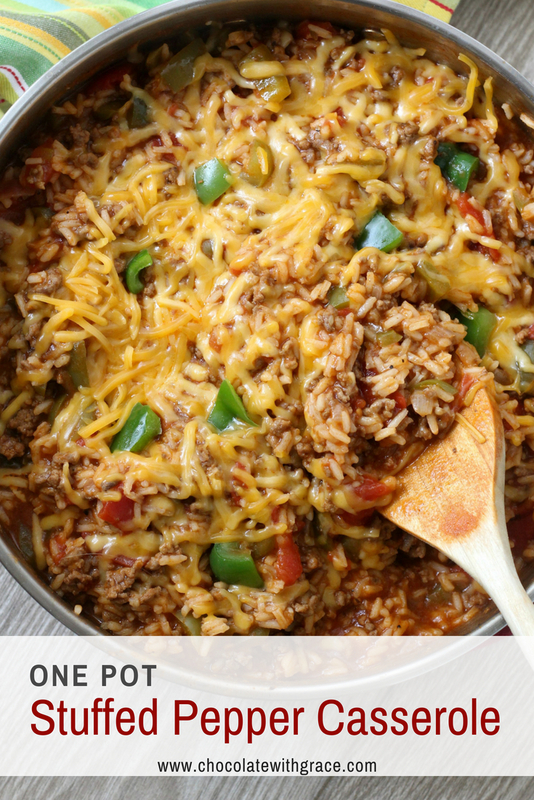 Stir the ground beef and taco seasoning together per the instructions on the taco seasoning. Prepare all vegetables and toppings. Stir together the French Catalina and Italian Dressing. Keep ingredients separate until ready to serve. 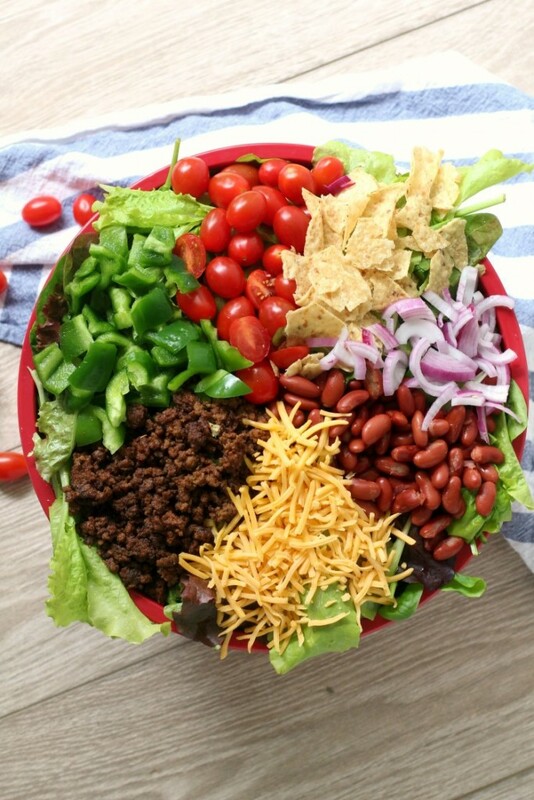 To serve, toss all ingredients together in a large bowl. I like to reserve some of each topping to add on top after mixing it all together. It's best eaten immediately. 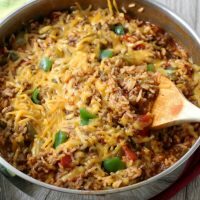 Looking for some other Potluck sides that are sure to be a hit? Try these. Put your leftover pot roast to good use in this Leftover Roast Beef Pot Pie. It re-purposes all the beef, potatoes, carrots and gravy into a delicious pie. 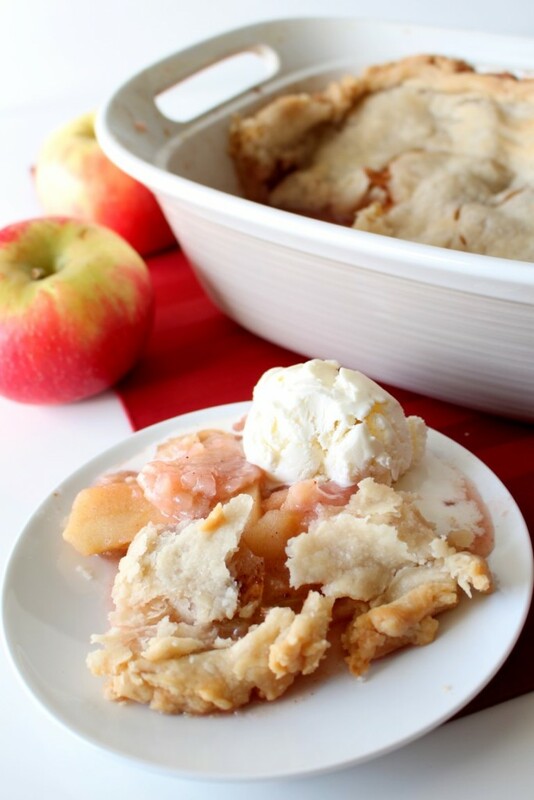 Feel free to use a pre-made pie crust to make this a quick and easy dinner recipe. 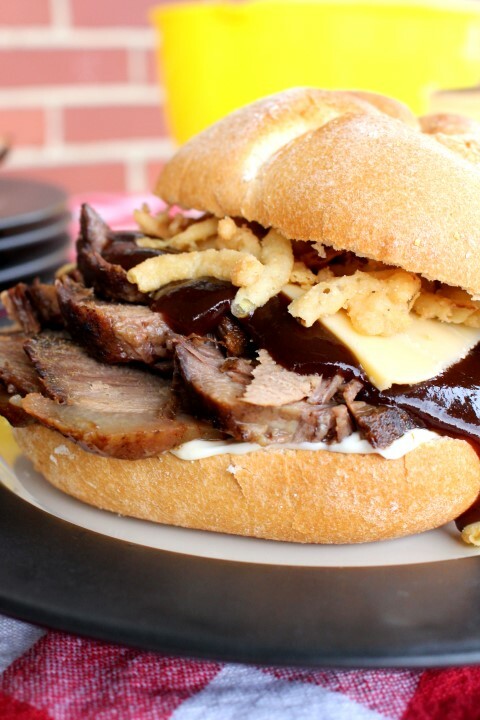 These “smoked” barbecue beef brisket sandwiches are actually made in the slow cooker. Fork-tender, they are delicious topped with barbecue sauce, mayo, smoked Gouda cheese and crispy onion straws. My husband declared them one of the best sandwiches ever. Its a lovely Saturday morning here. One where no one wants to be inside working on their computer or cooking in the kitchen. 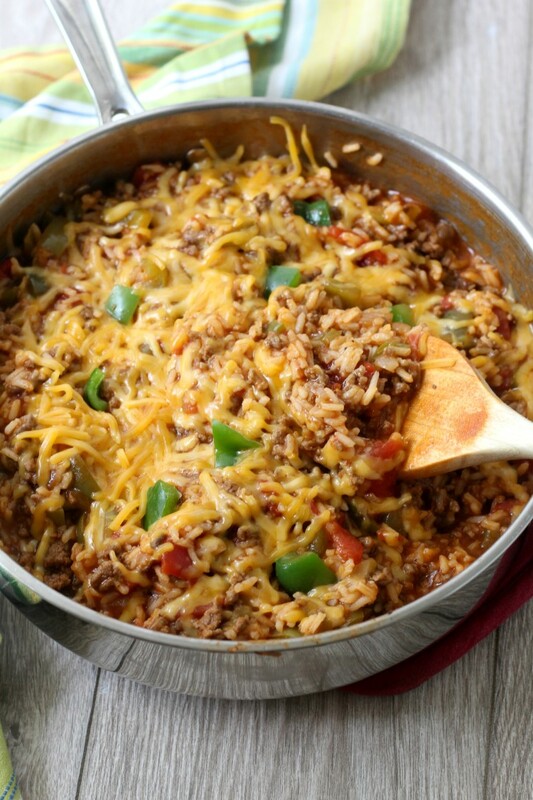 So I’m going to take five minutes to share a recipe you can throw into your slow cooker, forget about and enjoy tonight for supper. Inspired by one of our favorite Arby’s sandwiches, my husband has been asking me when I am going to post this recipe. I think it’s his favorite one that I have made to date. When I asked him what I should write about it, he told me to simply say they were the most amazing, fantastic sandwiches ever. So I present to you one awesome “smoked” barbecue beef brisket sandwich. These aren’t the best pictures you will ever see. (More practice is needed in food styling). This isn’t the best writing you will read. (sometimes I wonder if I remember anything for English class). But these are the best sandwiches you will have this summer….